When people think of a universal language, music is the first thing that comes to mind. Creating, editing or listening to music at a higher quality requires specialized equipment. While most people feel that some regular speakers or headphones will do the job, true audiophiles and aspiring producers know the importance of studio monitors and the superior range they cover. With a complete range of frequencies and higher audio fidelity, studio monitors are the real, ultimate speakers. Either for a better listening experience or work purposes, they are an excellent investment for those who want to up their audio game. One big issue with professional audiophile equipment is affordability. Generally, professional-grade gear can often break one’s bank, so it’s important to take a look at studio monitors that are accessible to the general population. The results, not price tags are the true measure of good speakers. Throughout this piece, we’re going to take a look at the Dual Electronics High-Performance Studio Monitors. Dual Electronics is the US-based subsidiary of Namsung, a South Korean company wherein its main aim is to deliver high-quality audio equipment that brings good value to the table. With products such as studio monitors, home speakers, MP3 players and such, Dual Electronics and Namsung provide consumer-friendly and easy-to-use audio products. Dual Electronics and Namsung have come up with a good-value product that’s suitable for a wide array of activities. Great for small studios or just for spicing up the mood in a tiny office or gathering place, the Dual Electronics High-Performance Studio Monitors come packed with user-friendly features, superior sound quality and more. 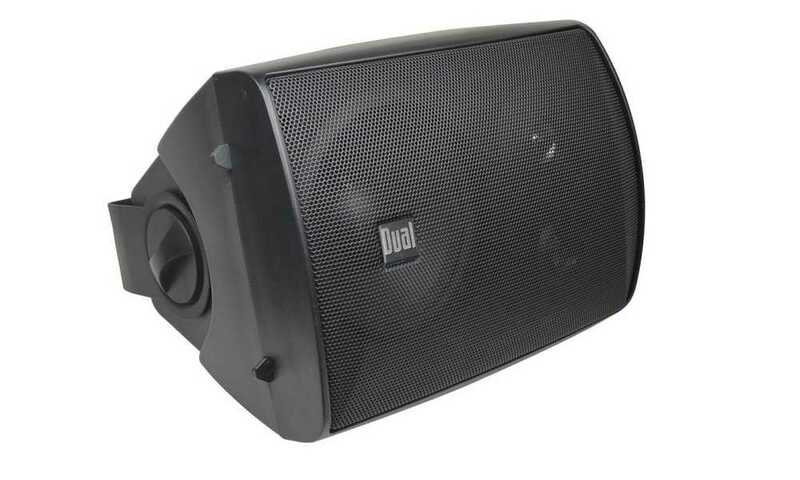 The woofer brings a 60-watt RMS making it capable of delivering quality sound to lighten the mood of a small crowd. In fact, you can even edit personal audio projects. It also has swivel brackets which are used for adjusting and getting the perfect sound setup, either for work or pleasure. Likewise, with its crisp, clear, and mid-level sounds, it is ideal for music studios. Delivering clear sounds at frequencies between 70 Hz and 20 KHz, they’re perfect for music production, mastering, recordings and everything else that goes down in the studio. As far as the low-end spectrum, an ideal frequency base would be 50 Hz for production purposes, but 70 Hz can work with a lot of genres, mainly those that aren’t very bass-intensive. On one end of the spectrum, 20 KHz will cover every frequency, so content creators aren’t that limited with what they can produce with this product. The product’s weatherproof coating makes it perfect for a terrace, balcony or an outdoor bar. While it’s an excellent short-term solution, it is not very resistant to powerful UV rays and rain. With that in regard, the speakers are prone to environmental damages after a year or so. In addition, the materials used aren’t very high-end, and the design is not as outstanding as other similar products. Nonetheless, although they’re pretty straightforward and rudimentary studio monitors, they do get the job done. The design allows the sound to be dispersed in a controlled direction with hardly any diffusion occurring during listening sessions. This is great since studio monitors must be arranged in a certain way for it to be used at maximum efficiency. Likewise, the sound must form a group and appropriately dispersed. Overall, they’re robust and durable, something that’s quintessential in a good studio monitor. Something else to mention is that they come in both 125 and 100-watt versions. However, the 100-watt version has a lesser frequency coverage and a weaker RMS rating. Also, it is not very suitable for studio work since the already high 70 Hz low-end frequency base goes up to 100. Hence, they can only be used for casual audio-listening activities. For the average consumer, picking the right pair of studio monitors can be a drag since they will find a lot of variables before they make a final decision. With that being said, a good pair of monitors should be robust, have adequate frequency coverage, loud enough to fill a studio and must have good sound dispersion capabilities. 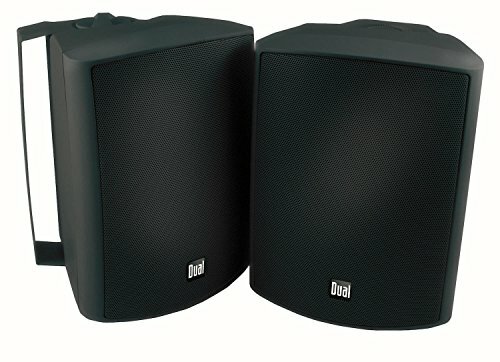 To help you decide, let’s take a look at Theater Solutions Indoor or Outdoor speakers, a product that’s similar both in price and features to the Dual Electronics monitors. The first difference that pops up is the size which is considerably smaller. Likewise, with 50-watt higher peak power consumption, the speakers deliver frequencies that are more limiting between 80 Hz and above. The steel brackets don’t provide such a high level of tilt which limits the user’s ability to adjust and customize the angles. Furthermore, they don’t even offer adequate outdoor protection, making the Dual Electronics monitors more superior in all essential aspects. By just spending a bit more money, the Dual Electronics Monitors have superior build quality, better frequency coverage and are overall more useful. They’re undoubtedly an all-around better choice for small studios, living rooms or offices. The market is full of speakers, studio monitors, or audio equipment in general, so it’s understandable why shoppers are so confused. That being said, Dual Electronics crafted a beautiful entry-level pair of studio monitors. It is excellent for listening to music in a small space or for amateur producers and content creators. With a solid build, good drivers and features that make it useful in a lot of different situations, the Dual Electronics High-Performance Studio Monitors is perfect for those who want to increase sound quality in a big way and still get that value purchase.